Indonesia archipelago should be proud because it has a tourist attraction which is said to be the largest fort in the world. The object is located in the City Baubau, Southeast Sulawesi Province. 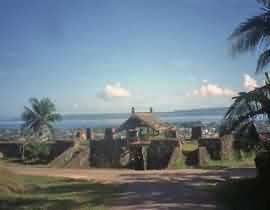 The fort that was built to protect the royal palace in the past Buton is also known as the Thousand Fort. The fort stands strong at the top of the hill. That said, the fortress built in the 16th century is the largest in the world. The extent reached around 22.8 hectares of land with a wall along the 2,740 meters. Built with mountain rocks bonded with sand and limestone, the fortress’ height varies between 1-8 meters with thickness between 0.5-2 meters. The fort has 12 doors and 16 defense posts. At every door and corner mounted a cannon fort. There are total 100 cannons. In the area surrounded by fortress walls, there are many small fort. 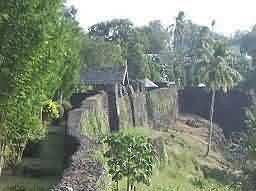 Therefore, Buton Fort Palace was also known as the Thousand Forts. Small forts became the main fort supporter. And each castle is connected with a secret path. Among the those small forts, the most famous is the Sorawolio fort. 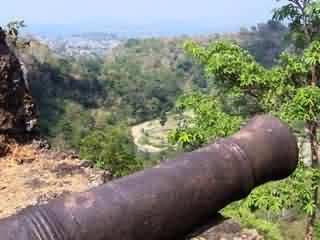 It is said, that the fort served as the last defense and royal family hiding-place if the enemy occupied the main castle. The other is the Baadia that serves as surveillance fortress. It’s positioned higher than the surrounding valley. There is also Katobengke fort. Captured enemies are executed in it. Historic sites are also found in the fort, such as popaua stone (inauguration stone for king/sultan), malige (traditional house), masigi (mosque), and sulana tombi (flagpole). Sulana Tombi located on the right masigi used to to fly the flag / banner of the Sultanate of Buton. The 21 meters high flagpole was built in 1712 during the reign of the 4th Sultan Dayanu Iksanuddin and the 5th Sultan La Balawo known as Sultan Abdul Wahab or Watole yi Mosabuna. Sulana tombi is now supported by 4 pillars because it’s aged and worn. The Teak wooden pole had been struck by lightning, but still stuck and have been waving a lot of flag. First, the Buton Palace’s, the Netherland’s, Japans’ and lastly the Indonesia’s Red and White.